This giveaway is now CLOSED. Thanks so much to our wonderful sponsor Protect-A-Bed! We look forward to working with you again! The winners are 'Ardy22' and 'AMWeeks'. Remember: There are great giveaways active on the upper right hand side of the page! You are probably somewhere in the middle of a leftovers coma, exhausted from shopping, cleaning, decorating, hosting and entertaining. You probably just want to crash. But your mind isn't turning off at night and you toss and turn and fight with your pillow. Yet that never seems to happen when you are on vacation at that luxury five star resort. Are their pillows filled 'magic fluff'? Probably Not, but they are a lot different from the ones you are currently using! I'm a bit of an insomniac and as a result often-times fight with my pillows. I went through a long period of sleepless nights where I swore if I just could find that magic pillow my sleep would just happen instantly and become better, more profound, somehow more...perfect. I've learned the hard way that while the wrong pillow does indeed have a lot to do with lack of rest, my night habits before bed could use some improvement too. My bad pre-bed habits will probably take longer to change than adapting to this new pillow system will! A revolutionary new pillow system featuring Tencel®, the new age fiber better than cotton. The Luxury Pillow System is supersoft and fully adjustable to your own comfort level, while providing ultimate stain, allergy and dust mite protection. This Luxury Pillow contains extra, specially developed, microfiber filling which makes the pillow supersoft and fluffy. Each Luxury Pillow also has a unique zipper closure which allows you to adjust the amount of inner filling. By removing some of the filling, the pillow can be adjusted to exactly the right balance of height and firmness to suit individual preferences. A luxury pillow - luxury sleep. First and foremost what I appreciate is the microfiber filling. I am allergic to down, which removes a ton of pillow and jacket options from my life. And for many years it also felt like I had to sacrifice comfort due to my down allergies. I truly missed my Down Pillows from when I was younger, UNTIL NOW. I am super happy to have the comfort of down, without the wheezing and sneezing. My advice, sleep on it, AS IS for a full week before you add or remove the extra filling that comes with it. The first night you will probably be under the assumption that regardless of what it says your head is going to sink into the mattress anyway, it won't. If you are a heavy stomach sleeper you may end up wanting to actually remove a little of the filling. If you are a back sleeper, you will be delighted that your head and neck don't just sink. And if you are a pre-dominant side sleeper you will find it refreshing not to have pillow in your nose! Protect-A-Bed’s Luxury Pillow Protector has a natural Tencel® surface which has a soft and silky feel, is hypoallergenic and antibacterial. 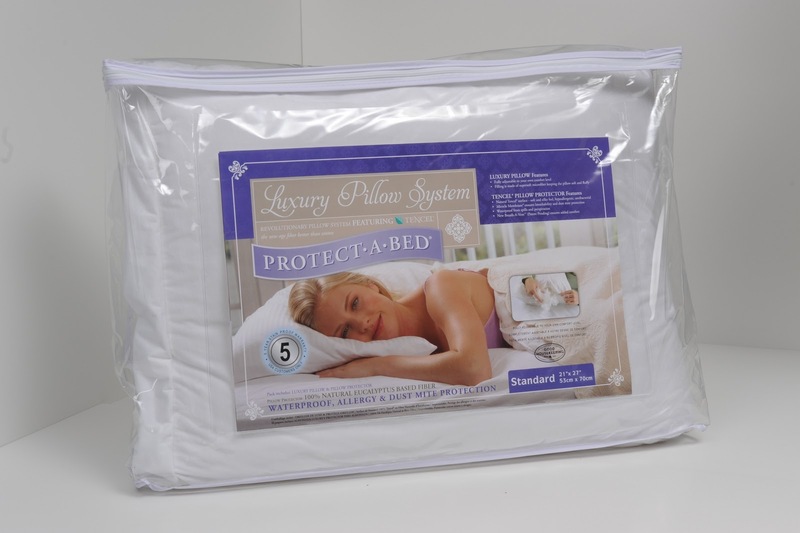 The product also features the innovative Miracle Membrane® that provides a barrier for the pillow and the user to protect against allergens, dust mites and spills. Protect-A-Bed's® all new Breathe-A-Vent (patent pendling) ensures added comfort by allowing your pillow to breathe. Again, because of my allergies, I'm very grateful for the Protector serving as a barrier to protect my pillow and my sleep! The fact that the protector still allows the pillow to 'breath' is very important. It allows it to also remain cool, so that you are not seeking out a cool spot even while sleeping which will allow for a much more profound rest. Ƹ̵̡Ӝ̵̨̄Ʒ - WIN IT! - Ascending Butterfly and Protect-A-Bed, would like to provide 2 Ascending Butterfly Followers with a Luxury Pillow System! Don't you just ♥ Protect-A-Bed? I know I do! Ƹ̵̡Ӝ̵̨̄Ʒ - How to Win: (1) You must be a PUBLIC follower of Ascending Butterfly to be eligible for this and all giveaways. Indicate in your entry that you follow (if your 'comment name/user id' differs from your profile id, please let me know what name you follow under) and Mandatory Entry: 2) Visit Protect-A-Bed and link us to another fab item you like, just remember it can't be the review item! (3) You must also leave your email address somewhere in your comment. (You can format it this way for security, example: ascendingbutterfly AT mail host DOT com). (If your email is clearly visible in your profile, you can just say so, that's OK!) Please follow the easy 1, 2, 3 steps to winning (or in this case, the A,B,C’s of winning!) This giveaway is open to USA residents who are 18 years of age or older. No PO Boxes. Thank you readers, because of your push, this giveaway was listed as a Prizey Pick! I hope you will do the same for all of our wonderful sponsors in this year's holiday buying guide! Ascending Butterfly readers ROCK! Right now, I like the Bed Bug Protection kit! In the spirit of Christmas fun, how about an extra credit for sharing your night before Christmas ritual: every Christmas eve we all gather around the tree and we open only one gift, each person presents the one gift to another family member. We remember the reason for the season and as each of us opens the first of many gifts to start the blessings of the holiday. I like this aller zip crib mattress. http://www.protectabed.com/Bedding_Protection_Kits/subgrouping.htm?cat=30647 as we are looking for a new mattress, but can only afford used. to see if it cuts down on my daughters nighttime asthma attacks. We all get to open one gift of our choice on christmas eve. It is part of our ritual. I could use the Luxury Sheet Pack. On Christmas Eve we all gather at my niece's house and have appetizers and champagne. my daughter is only 2 so this is the first fun christmas but she still doesn't understand the santa and presents part. last year we started reading the night before christmas before bed and i know we'll continue that and add on to it! we always see the festival of lights Christmas eve and then open one gift which I make sure is always new PJ's. I'm a follower. 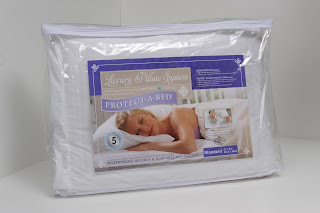 I also like the mattress protector: http://www.protectabed.com/PREMIUM_Mattress_Protector,_38x75x14,_TWIN/product.htm?pid=643044&catid=30608. Christmas Eve we spend at my grandparents every year! We pick out a movie and my teens and I would watch a movie or two, dear cheap stingy hubby usually is in bed by 9:00 he doesn't participate much at all with family, there is no gifts to assemble or wrap because they have been wrapped before hand as gifts are limited to what I have managed to be lucky enough to win or purchase with the money hubby has deemed necessary for gifts which has never been more then $200.00 for everyone. I am a gfc follower of yours as Corky..
Christmas Eve is when we put our star on the tree and hang our stockings! I follow your blog. I'd like to get the premium crib protector for my new niece. I follow Tracy on twitter @Aerated. I follow Protect A Bed on twitter @Aerated. I follow your blog! (amweeks). And I'd love one of their QuiltGuard Cotton Mattress Pads at: http://www.protectabed.com/QUILT_GUARD_COTTON_MatProtector%2CFULL%2C54%26%238260%3B75%26%238260%3B14%3A_6%26%238260%3BCtn%26%238260%3B3.69%26%2339%3B/product.htm?pid=655061&catid=32602. Email in profile. Please replace this with the original post. i want the whole shebang! I have a new grandbaby and this mattress protector would be greatly used. Our night before Xmas ritual is letting everybody open 1...1 I say...Xmas gift. I follow Follow @Protect_A_Bed on Twitter on twitter. Christmas Eve my husband and I are in Mexico and our ritual is to spend the night with our mexican friends who after closing their shops, going to church, they have their dinner with the 'liitle ones' around one am lol, and they celebrate to dawn. Mexican children do not get gifts until Jan 6th kings day, then they only get three. they are the happiest children. They celebrate the true meaning of Christmas, and we are honored to share it with them! The night before Christmas, we watch the Christmas Story as a family then we sing a Christmas carol while we all open one gift. I have redone the main entry..sorry! I follow on GFC and I like the QuiltGuard Terry Mattress Pad. Liked Protect A Bed on FB. We make fried pizza pockets and watch midnight mass from Rome on tv.